Is Ryan McMahon must-draft? Has Caleb Smith positioned himself alongside Trevor Richards as a late-round sleeper? What does the Gio Gonzalez signing mean for Domingo German? Scott White looks at the latest spring happenings. Garrett Hampson has been hyped as the next big thing since before draft prep season even started. Part of it's because of the scarcity of stolen bases, a category in which he should thrive. Part of it's because he seemed like an obvious front-runner at a position where defense is valued. So what's changed? Nothing on his end. He has done exactly what he needed to do to secure the job this spring, batting .313 (10 for 32) with three homers and a spring-leading six steals. It's just that his competition, a displaced third baseman, is the spring leader in everything else. It's not really an exaggeration. After another two-hit game Monday, one that saw him hit his third home run and seventh double, Ryan McMahon leads all players, Grapefruit and Cactus Leagues combined, in batting average, on-base percentage, slugging percentage and hits, striking out just six times in 45 at-bats. McMahon has been a player who has often had trouble finding his swing, which explains some of the inconsistencies throughout his minor-league career. But he put in the work this offseason. Among the changes: He repositioned his hands to shorten his swing after struggling to catch up to big-league fastballs last year, and he modeled his stance after Daniel Murphy in an attempt to generate more power. "One of the things that is important is good posture in baseball," McMahon told The Athletic. "If I get the bat up, engage my core, now when I go to hit, I clear with my hips and my hands stay longer on the ball. You see Murphy doing it. He starts in that position. "Now I feel normal again. It feels like how I used to." Wait, like he used to? Yeah, there's a reason McMahon has been hyped in the past. Just two years ago, he hit .355 with a .986 OPS between Double- and Triple-A. Considering where he'll be playing his home games in the majors, the upside is immense — better than Hampson's, frankly. Which isn't to say Hampson won't matter in Fantasy. He has played his share of shortstop and center field this spring, positioning himself to make the club as a super utility player. But McMahon is looking like the better bet of the two to get consistent at-bats and is potentially someone you could draft with your very last pick. The Marlins may have held him back early this spring because of last year's lat injury, but clearly it isn't preventing him from taking on a starter's workload. And he has looked dominant in the past, averaging 10.2 strikeouts per nine innings last year thanks to a fastball that boasts one of the game's highest spin rates. The way he has thrown strikes this spring, small though the sample may be, could indicate he's ready to take the next step. True, he hasn't been the only Marlins pitcher to impress, but manager Don Mattingly said Monday that Jose Urena is the only lock for the rotation, allowing for more openings than previously thought. "We'll leave ourselves some options and variations of it," he told MLB.com. "We don't know who the five or six are going to be." The Yankees have a deal in place with Gio Gonzalez, giving the longtime Nationals standout an opportunity to contribute in the majors this year. See, it's only a minor-league deal, and while the Yankees have openings in their rotation right now with Luis Severino and CC Sabathia expected to begin on the IL, those opportunities may be closed by the end of April. Gonzalez isn't ready to step into them yet. He'll need some time to build up his workload. And seeing as he has an opt-out if he's not on the big-league roster by April 20, I'm inclined to think it's just a break-in-case-of-emergency play, the emergency being that young hurlers like Domingo German, Luis Cessa and Jonathan Loaisiga prove incapable holding down a rotation spot. They're the ones to root for, though. Gonzalez's fastball velocity has dropped over the past couple years, crippling his greatest strength (the strikeouts) while exacerbating his shortcomings (the walks). Pitchers with a 1.44 WHIP, like he put up last year despite a typical BABIP, don't make it far in today's game. German, meanwhile, averaged 10.7 strikeouts per nine innings during his time in the majors last year, featuring three genuine swing-and-miss pitches. It didn't always go smoothly, but it has this spring, during which he has recorded 18 strikeouts against just two walks for a 1.54 ERA across 11 2/3 innings. He's the one you want, not Gonzalez. Whenever a one-time prospect shows a glimmer of potential — particularly at the start of a new season, when he has had a chance to process what went wrong — you have to take it seriously. Refusing to do so is a surefire way to miss out on breakouts. But after offering early indications he might be on the verge of one, Lewis Brinson's spring has taken a turn for the worse. The 24-year-old struck out three times in four at-bats Monday at the Nationals, making him 1 for 16 with five strikeouts in his past five games. All the caveats that applied before do now as well. The sample size is too small to mean anything independent of anything else. But given how dreadful Brinson was as a rookie last year, he needed to recapture the enthusiasm of Fantasy players this spring, and while it looked that way when he homered five times in his first seven games, he has nary an extra-base hit in nine games since. I'm not saying you can't take a flier on him late in a five-outfielder league, but I am saying his spring hasn't moved the needle for me. The Boston Herald was among the publications that declared Barnes the favorite for saves with Craig Kimbrel out of the picture, and it made sense. The Red Sox used Barnes in a high-leverage role last year, and he averaged 14.0 strikeouts per nine innings. But his spring began so disastrously that manager Alex Cora seems to be second-guessing the choice. "We'll see [on] March 28," Cora told MLB.com Monday. "Whatever we decide, they're going to know. They're going to know before you guys." The good news is Barnes may have turned things around in his last outing. Pitching coach Dana LeVangie went to the mound after Barnes had already allowed a run and informed him he was tipping his pitches. "First off, I thought too many good swings were taking place for a guy that was actually throwing really well," LeVangie said. "I don't think we'd seen that from Matt Barnes when he's throwing good pitches and they're having good swings. We had to have a little conversation." For what it's worth, Cora seemed to like what he saw, which would seem to indicate it's still Barnes' job to lose. "With Barnsey, I mean, the stuff is good," Cora said. "The breaking ball is good. Velocity is actually higher than last year. He's in a good place." Ryan Brasier is the only other viable candidate, really, and he got off to a late start because of an infection in his toe. The Cardinals have already determined that Alex Reyes won't be in their starting rotation to begin the year, and Carlos Martinez is of course headed to the DL. So who does that leave? Dakota Hudson, apparently. 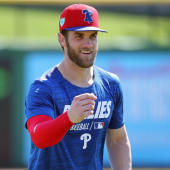 The 24-year-old had his best outing in a spring full of them Monday against the Phillies, striking out eight over five scoreless innings to lower his ERA to 1.72. Hudson isn't the only one in the running for the spot, of course. John Gant is in the mix, with Austin Gomber and Daniel Ponce de Leon on the fringes. Hudson looks like a heavy favorite, though. It's not clear how impactful he'll be in Fantasy given that he excels more at generating ground balls than missing bats, having averaged 6.3 K/9 during his time out of the bullpen last season and 7.0 K/9 in 19 starts at Triple-A, but the stuff rates higher than the numbers suggest (Baseball America ranks him third among Cardinals prospect this year). If nothing else, he's another relief pitcher-eligible starting pitcher to monitor in points leagues.